You can apply for an e-Visa 90 days before your Cambodian departure date (aka, the day you depart from Cambodia). We will let you know when that date is. The visa is currently $36USD per person and is payable by Visa or Mastercard; several people can submit their information on the same application, if you are traveling with loved ones. This particular visa will allow you to stay in Cambodia for 30 days. 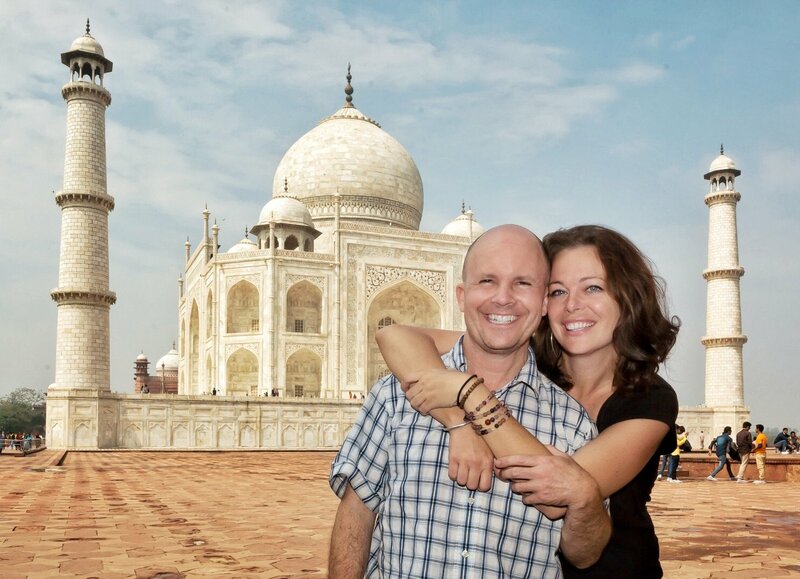 The e-Visa is actually a breeze (especially if you have ever applied an Indian e-visa!) You’ll need a digital passport headshot; there are plenty of apps out there to help you with that. You’ll also need a photo or scan of your passport info page; that image will have to be under 2MB. If you need help getting your image to fit that specification, you can forward it to Lauren and she can help reformat it. You’ll begin at https://evisa.gov.kh and select “Application” from the menu. 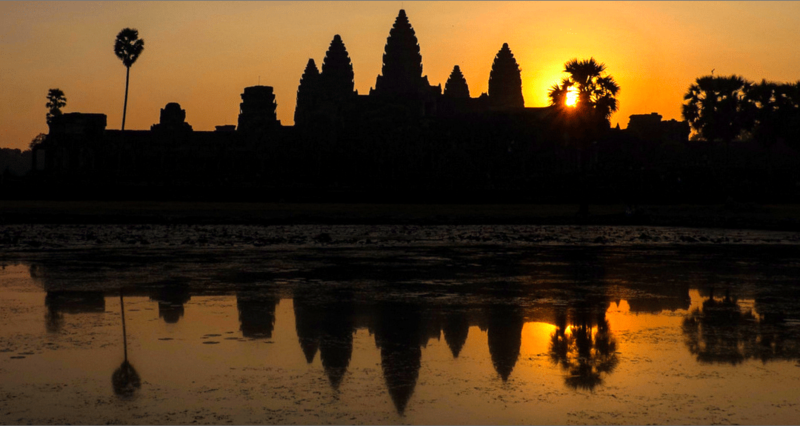 Here is what you will need to complete on the first page (we will inform you of your arrival date and your hotel name; unless we tell you otherwise, your Port of Entry is Siem Reap International Airport). From the next application page you just need to “confirm payment,” which should really read “submit payment.” (Your amount will be $36 USD or $36 multiplied by however many applicants are on this submission; in this example it was for two applications). On the next page you can choose your form of payment (between Visa and MasterCard), and after that, you can submit the details (as shown below). You will not be asked for a billing address. Do not close any windows or hit back in your browser while this payment is processing, which can potentially take a couple minutes. If by some chance your card payment does not go through, it may be your credit card’s fraud prevention, and it may require a call to the credit card company. This is the email you will receive immediately; it is not an approval of the application but telling you that it is being processed. It says the approval should take less than 3 days, but our approval took about ten days, so just be patient. If you are concerned, you can keep checking the visa status within their system to make sure you didn’t miss an email from them. When you are approved, you will receive an email with your visa as a PDF attachment. Please print two copies (they can be in black and white) and also save to your phone or tablet in case you need to reprint. You can see what that Visa PDF looks like by clicking here. 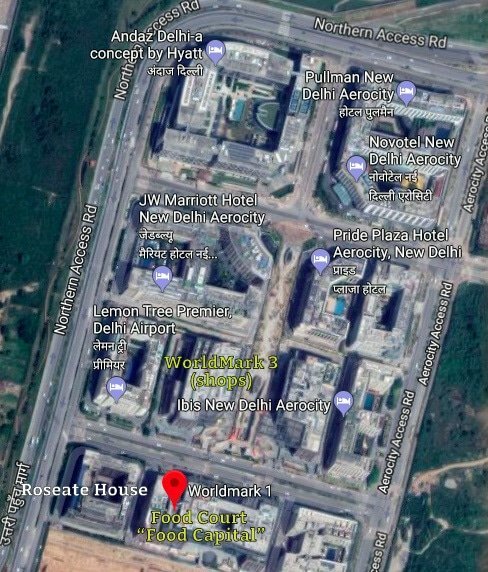 Staying at Delhi’s Aerocity is a good choice for those who arrive late at night or with an early morning departure (or the unfortunate combination of both!) It is just an easy 8-10 minute drive to the airport, allowing you more time resting at your hotel than sitting in Delhi traffic. Here are some tips to make your stay in Aerocity more familiar. Please notice Worldmark 1 and 3 denoted on the map. Aerocity’s hotels take pride in their security. When you enter the hotel, your carry-on (and purse) will have to go through a scanner, and you will also be pat down (females will enter a curtained area for a private pat-down by a female security guard). Please be prepared for this every time you enter, not just your initial arrival. You will also encounter the same security when you enter the Worldmark shopping malls. Each hotel at Aerocity has multiple restaurants inside, representing different cuisines from all over the world. However, if you are willing to venture out of the hotel, there is a fantastic food court in Worldmark 1 called “Food Capital,” on the 3rd floor. Although you can find international chains like Subway and Pizza Hut there (each with their own Indian twist) there are some fantastic Indian restaurants there, as well. Karim’s is a delicious Delhi institution and their kiosk is definitely worth a stop. Biryani Blues is also a great option. These are all great values compared to the restaurants inside hotels. If you are in the mood for SE Asian food, the restaurant “Noodle Republic” on the ground floor of the LemonTree Hotel is quite good. The Northern Thailand noodles (Khao Soi) are one of my all-time favorites there! There is a Starbucks in Worldmark 1, as well (facing the road, on the ground level). There is an ATM in front of the IBIS hotel in Aerocity that dispenses rupees (the upper limit is 10,000 rupees (~$145 USD) per withdrawal, but you can make as many withdrawals as your home bank allows). Worldmark 3 has a department store with Indian clothing, cosmetics, home goods, and even a small specialty grocery stocked with imports. Air travel is relatively similar all over the world, but those slight differences in a new place can throw you off your game! 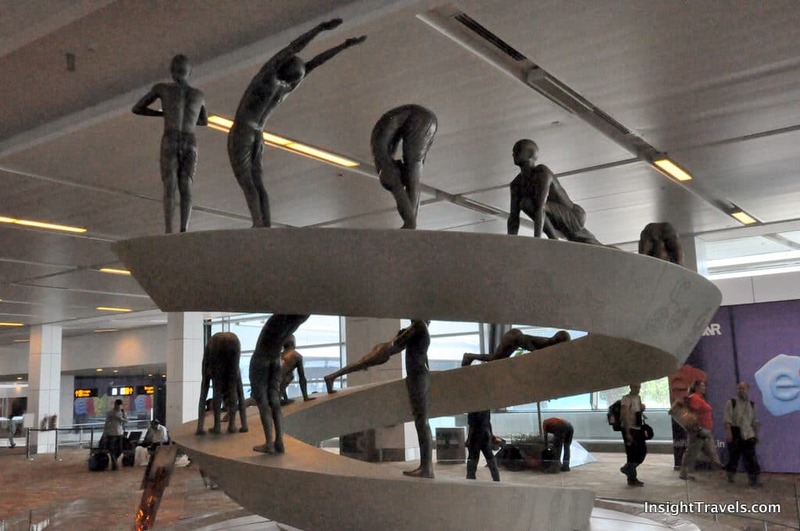 Here is a brief preview as to what you can expect when checking into Indira Gandhi International Airport in New Delhi, India. You will need a printed flight itinerary (or a screenshot of it on your phone) to even enter the airport. It must show your name, flight date and time and number. You will show this and your passport to enter the airport. Check the monitors for your flight to see what counter you should be checking into. Remember that international flight counters don’t open until 3 hours before the flight, typically. If your luggage weighs more than what is allowed, you must pay for more weight. Sometimes you can pay at the counter, and sometimes they will direct you where to go to pay this fee. It’s neither cheap nor fun, so do be mindful of the weight limits on your ticket. If you are leaving the country, you’ll first have to go through Immigration, which has the potential to have long lines. You don’t have to fill out any paperwork for this (as of Summer 2018), simply present your passport to the Immigration officer. If this is a domestic flight, you’ll go straight to security, instead. You will show your passport and ticket to an officer who will direct you to a screening line. You must put all carry-ons and personal items through the scanning machines, as with any other airport. Definitely remove your laptops, but you may wish to remove most larger electronic items, including cameras and tablets, as they will often rescan the bag if they detect these items. You can leave your shoes on, but do take any jackets off. Women and men will separate as they go through the metal detector and pat-down. Please bring your ticket and passport with you and present to the security officer. Men are pat-down next to the carry-on scanning machine and women go into an enclosed booth where a female officer will pat you down. Your ticket will get stamped here by the officer. After your pat down you will retrieve your carry-ons and electronics. Sometimes an officer may want to see your ticket, but oftentimes not. Enjoy the shops & restaurants of the airport, but keep your eye on monitors for gate changes and departures. Delhi is a quiet airport, so no announcements are made. India is also the only place we’ve been where planes tend to leave EARLY, so definitely be at your gate at the listed boarding time at the very latest. In Terminal 3’s domestic departure area, the walk can be pretty far (for any gate numbers below 30 or above 39), so please allow yourself 10-15 minutes to get to your gate from the central shopping/eating area.